Known for innovative design and expert craftsmanship, Van Cleef & Arpels has become one of the most influential jewellery design houses in the world. Graceful princesses, fairytale chateaux and exotic creatures from far far away are just a few of the magical elements found in the fantastical realm that inspires Van Cleef & Arpels’s Peau d’Âne High Jewellery collection. This exquisite collection tells the story of true love, not unlike the love story which led to the formation of the company in Paris, 1906. Once upon a time, at the end of the 19th century, the daughter of a precious stones dealer called Estelle married Alfred, the son of a precious stone cutter. This romance was to lead to the establishment of one of the world’s most sought-after jewellery brands—Van Cleef & Arpels. Estelle Arpels and Alfred Van Cleef established their own jewellery business in 1906. Their first boutique was strategically positioned in Paris’s fashionable Place Vendôme. Home to the Ritz Hotel, which attracted aristocrats and wealthy business magnates from across the world, Place Vendôme set the benchmark for Parisian style and opulence. While the marriage of Alfred Van Cleef and Estelle Arpels led to the formation of the company, it was the creative ingenuity of their daughter, Renée Puissant, that forged a path for the brand’s distinctive styles. On her appointment as artistic director in 1926, Puissant worked closely with designer René Sim Lacaze to establish a classic design heritage that endures to this day. The unique stylistic composition of the Maison’s pieces makes them instantly recognisable, and collections originally created by Puissant and Lacaze have had a long-lasting influence on modern jewellery. ‘Yes, the Maison has a recognisable signature style in its approach to movement, articulation and the asymmetry of the pieces. These balance with the transformability of our pieces, which draw their inspiration from unique sources including nature, poetry, ballet and imaginary worlds,’ says Bos. 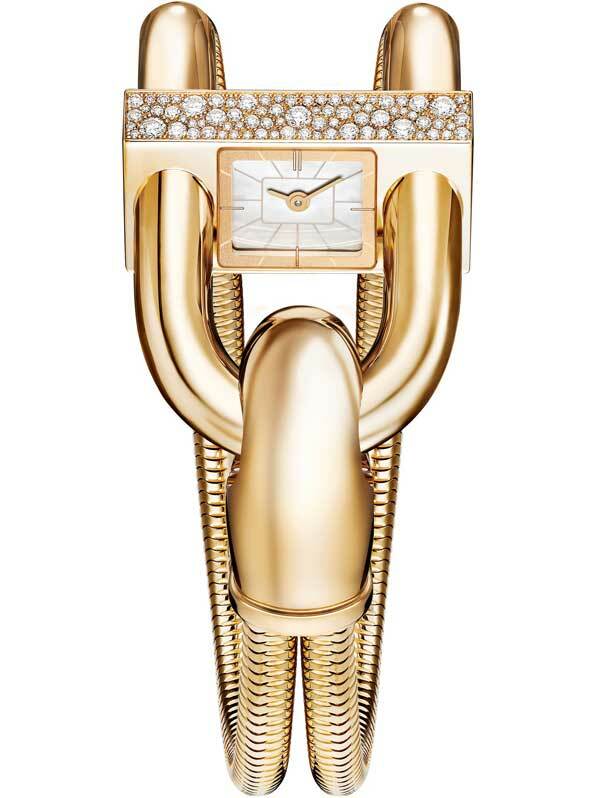 Signature Van Cleef & Arpels pieces include the Zip necklace and the Cadenas watch. The original idea for the Zip necklace was suggested by the Duchess of Windsor, a famous collector of Van Cleef & Arpels pieces, in 1938. Fashioned in round and baguette-cut diamonds, the first elaborate Zip necklace was not completed until 1951. Like many of the Maison’s pieces, the Zip necklace continually re-invents itself while still cresting the ever-changing waves of fashion. The Zip necklace was recently worn by actress Margot Robbie at this year’s Academy Awards in Hollywood. It is said that the Duke and Duchess of Windsor were also behind the design of Van Cleef & Arpels’s eternally popular Cadenas (padlock) watch. During the early 20th century it was considered a faux pas for young ladies to glance at a wristwatch, or even to wear one. To remedy the situation, Van Cleef & Arpels designed the Cadenas watch—an elegant timepiece that united the delicacy of a bracelet with function of a timepiece. The geometry of the watch also allowed the wearer to glance at the time without appearing to do so. This year, the Cadenas watch made a welcome return at January’s Salon International de la Haute Horlogerie (SIHH). Building on classic design elements that include the timepiece’s padlock hoop, Van Cleef & Arpels’s innovative design team also enlarged the watch’s dial and added 12 hour markers to enhance its readability. The jeweler has also created numerous design motifs that have become synonymous with the brand. The floral Alhambra pattern is one such example, and jewellery incorporating the motif was worn by Princess Grace Kelly of Monaco on numerous public occasions. However, the unlimited possibilities of the brand’s artistic inspirations are only one of the reasons its pieces make such treasured collectables. ‘Van Cleef & Arpels is also remarkable for its innovative techniques, the exceptional quality of stones and the virtuoso craftsmanship of its Mains d’Or,’ says Bos. Indeed, the company has developed and patented several unique ways of combining precious metals and stones. For example, the ‘Mystery Set’ was developed in 1933 as a way to set stones so no prongs are visible. The technique requires such skill that producing a single brooch takes a craftsman 300 hours, which is why the Maison produces only a few ‘Mystery Set’ items per year. The innovative design and craftsmanship exemplified by Van Cleef & Arpels means that the brand’s popularity is soaring, and many new boutiques have opened in the Middle East and East Asia over the past decade. ‘With 109 boutiques worldwide, we expect to offer the same high standards and enchanting universe to an international clientele,’ says Bos.